SKU# GGSSFF01 complete sand and finish with Glitsa gold seal system($.per Sqft) Call for Current pricing oo Costs! The toughest hardwood floor coating is also the most beautiful with a self healing skin making it very difficult to see scratching impressions from a standing position. 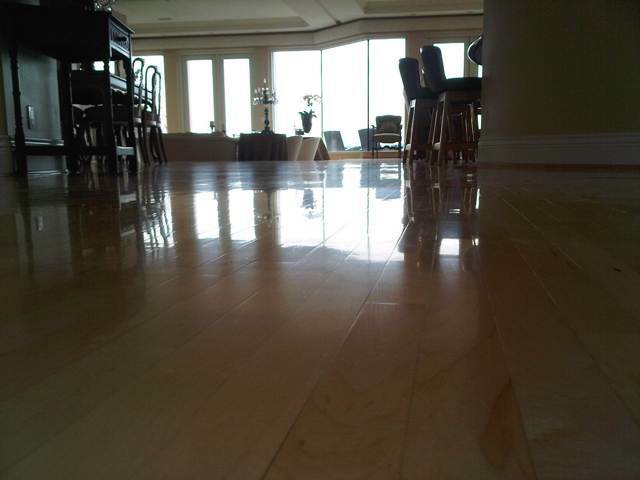 Refinishing hardwood floors with the Glitsa gold seal conversion varnish Swedish finish system is AHF All hardwood floor ltd's Premium floor coating product This is the hardwood floor industry's top performing most reputable wood floor surface coating. This Swedish finish offers a soft subtle look and is available in all sheens or levels of gloss semi-gloss satin and matte finishes. Glitsa these days manufactures many different types of floor coatings the last twenty five years . The original Glitsa gold seal line of product is around sixty years old. AHF hardwood floor ltd has been using Glitsa gold seal exclusively since incorporating back in 2004 because Ken Moersch has been using Glitsa gold seal Swedish finish for 35 years since 1979. Only a few small numbers of select hardwood floor professionals use this Solvent based "FLOOR VARNISH" product these days here in the Vancouver Lower Mainland of BC area. Its all about education and research on behalf of our customers and clients. Since site finished hardwood flooring is a luxury item or investment size money it is extremely important to research the subject first in order to get a greater understanding of what is quality in the context of the wood floors providers. 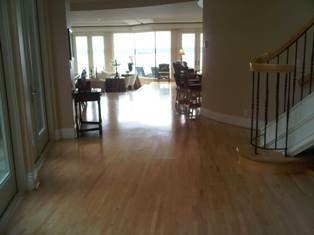 This Floor finishing product requires extreme talent not commonly available n the Vancouver BC area. Skilled certified master craftsman hardwood professional floor layer sander or finisher." The hardwood flooring industry is largely unregulated with non-ticketed or unlicensed technicians filling the labor role AHF's Ken Moersch of all hardwood floor ltd and stairs is a reputable top quality hardwood floor contractor and has supplier that specializes in fine hardwood floor craftsmanship, Glitsa Swedish finish and all Glitsa finish coatings products are my specialty for on site sanded wood flooring and floor refinishing of all types. AHF The Glitsa Gold Seal Swedish floor finish(conversion varnish), As a traditionally union trained apprentice back in the early eighties Glitsa Gold Seal Swedish finish was the industry standard sought after by interior designers, architects and influential construction companies from all over the Vancouver lower mainland and British Columbia in general. Today This traditional conversion varnish coating is known to be the best looking and the most durable. Glitsa "Swedish" floor finish is truly unique amongst the vast sea of floor coating products today, the only one of its kind"
Glitsa gold seal Swedish hardwood floor refinishing Swedish refinishing can be a change from the old yellow finishes as an alternative we can stain the hardwood flooring a color such as coffee brown , antique brow, spice brown, medium brown, ebony, cordovan and more . 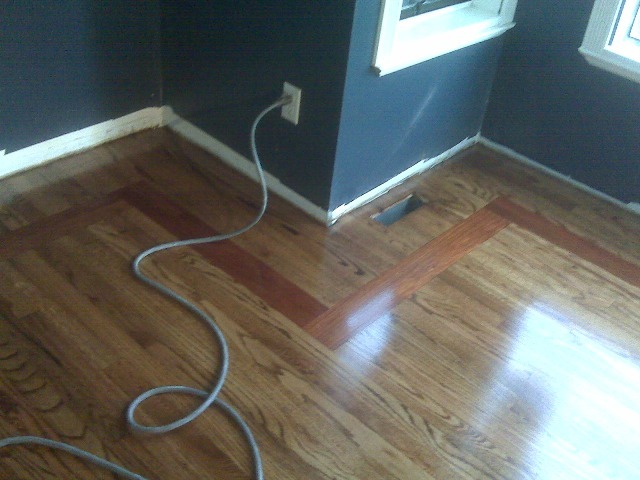 Staining the hardwood floor is surely a contrast, an option to the lighter natural clear coat. A complete Refinishing any hardwood floor starts off by Sanding the floors back to bare wood, the resurfacing process starts by rough angle sanding Most hardwood floors will require to be rough sanded especially the plain sawn or flat grain planks and strips, parquet floors fore sure. three to four sanding passes are required and i will usually do the edging perimeter floor sanding three times around, The sanding passes are a complete once around the whole floor with rough medium and fine sanding grits. Full trowell flood filling in between sanding and graduate sanding to a fine one hundred grit or double oo . Sand with a sanding screen to burnishing with a polisher after hand sanding all the short ends and lengths and this hardwood floor surface is ready for the next process either staining the hardwood floor a stain color or a variation of a natural clear(transparent) or natural opaque(pastel ) keeping the wood floors light as possible and leaving the future repair touch-up or maintenance options open for many years down the road, such as screen and recoating to renew the original sparkle and shine. This is what sanding the floor is all about preparing for the finish. Glitsa™ gold seal Swedish finish system Bacca™ floor seal and Gold Seal™ top coat. Bacca is a 2 component mix similar to epoxy as it has both a chemical dry and a load the air moisture cure, very interesting stuff. Bacca is light amber in tone and by adding additional layers of Bacca and enough sunlight will cause yellowing or ambering of the coating. Sealing the wood floor can be achieved by any method preferred, Bacca is high gloss high build and will manipulate very easy after about 5 hours per coat. Flow rates can very depending on humidity and temperature levels we achieve max heavy load flow of 250 Sqft with fresh material using a thick lambs wool applicator over my trowel led seal coats, This is not a highly paintable coating as the directions call for apply freely and do not over brush the wet material you have about 25 seconds or so. Glitsa Conversion Varnish Top Coats Gold Seal™ and Lite Scent™ Top Coats the tuff stuff. This material is opaque and has no amber tone available in matte, satin, and semi gloss. During the curing process ( gas trapped from the underneath of surface skin)brings transformation as the product becomes much more soft and subtle in appearance and in the case of a stained floor tends to look much more uniform and even consistency. The smell to disappear in a few days almost as quickly as it arrived. Gold Seal Hardwood floor refinishing coating is an on location service, Let us come to you we will be bringing the best hardwood floor sanding machinery and sanding tools maintained to make my life easy and your floor look amazing, from there its all about the passion, patience, perseverance, skill knowledge of master craftsmen floor layer Ken Moersch to bring alive amazing wood floor results refinishing your hardwood floors, stairs or gym flooring. Dustless Hardwood floor sanding machinery require 220 Voltage s/phase 30 amperes. Gym floor rider sander setup needs a 90 amperes breaker 3 phase 208 or 480 volts. Pilot lights and gas may be shut down if necessary for solvent based coatings..
Glitsa gold seal finished floors. Sand and grit will cause premature wear. will help prevent the spread of such material. floors by the pad manufacturer. dampened (not soaking wet) cloth-or paper towel. Keep your shoes in good condition ... high heels without a protective cap can actually dent the wood! Trim and buff your pet's claws often. As an extra precautionary measure, you may place booties on their feet to prevent premature scratching and wear. Be sure your chair legs and other pieces of furniture all have Glitsa Safeglides Felt Floor Protectors on them. Without protection, constant sliding and movement will prematurely wear and scratch your floor; Safeglides are available for purchase online or through your contractor . Do not ever wax your Glitsa finished floors or clean them with an oil-treated solution. Wax and oils Can contaminate your floor, creating adhesion and other problems with future recoats. 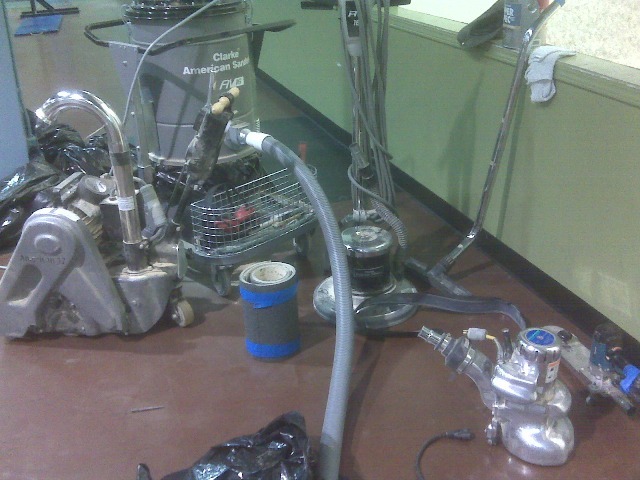 Even the most well-maintained floors eventually need recoating. Prior to a complete recoat, use 'Glitsa Gold Seal Aerosol to repair minor blemishes in small areas for the Gold Seal Swedish System. Do not attempt a repair of this sort on bare wood; instead, call your local professional contractor and ask for Glitsa gold seal Varnish finishes. repaired. Write down the company name of your floor installer and finisher. If or when you move, leave the above information in the home. 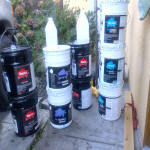 Glitsa American, Inc. provides floor-finishing products intended for use by professional floor contractors only. We are determined to continue to provide our distributors, contractors, homeowners, architects, and designers with superior products and technical support to ensure safe, error-free applications, to maintain the integrity of our products and the satisfaction of our customers. Our safety and health recommendations are intended to be general guidelines. Individuals with medical conditions or that are typically more sensitive to odors should consult their physicians and extend the time allowed prior to returning to the residence. Material Safety Data Sheets (MSDS) are available upon request. expect it to be as flawless as a piece of furniture. Furniture is finished in a 'dust free' environment and is subjected to quite a bit less wear and tear than a floor. The following information is intended to answer many of the typical questions that we have experienced over the years. If you would like any additional information on our products, or the location of your nearest distributor, please call Glitsa American, Inc. at 800-527-8111. Cover or remove Carbon Monoxide detectors as they may be activated or damaged by the vapors. All individuals remaining in the area should wear a NIOSH (National Institute for Occupational Safety and Health)IMSHA (Mine Safety and Health Administration) approved respirator. Following the final coat of Glitsa, we recommend waiting 24 hours before returning to the residence. At this point you may walk on the floor. Providing good ventilation will minimize the odor and help the floor finish to cure faster. The more gentle you are on the floor during the first few days, the more satisfaction you will get from your floor for years to come. Allow 2-3 days before placing furniture on the floor. Do not drag or slide the furniture. Allow 5-6 weeks before putting carpet or rugs on the floors. Do not use water or any cleaning substances on the floor for the first 2-3 weeks. Because it is impossible to create an absolutely dust free environment in your home, small specks of dust (peaks) may settle in the finish. Over time, many of these peaks will be walked out of the finish. Place walk-off mats in entryways and near sink areas to minimize the amount of dirt and water that comes in contact with your floor. Attach Safeglides® to all furniture that will come in contact with your wood floors. Safeglides® have multiple types of fasteners that will adhere to most furniture. -Prevent unprotected high heel shoes from coming in contact with your wood floor. The amount of weight concentrated in such a small area actually compresses the wood and appears to be anindentation in the finish. -Wipe food and other spills immediately with a water dampened cloth or paper towel. -Vacuum with soft bristle brushes only. Most carpet vacuums have hard bristle brushes. -Sweep with a soft (nylon) bristle broom. Straw brooms may scratch the floor. -Damp mop the floor to remove dirt and grit. -Do not use oils, waxes, or cleaners that have these properties in them, on your Glitsa finish. -Do not over-water plants. Soils, fertilizers, and plant foods may have chemicals in them that could damage your Glitsa finish. Soft rubber (shoe soles, toy wheels, etc.) wil1 1eave marks on the floor. Most of these marks can be rubbed out, but should be avoided if possible. 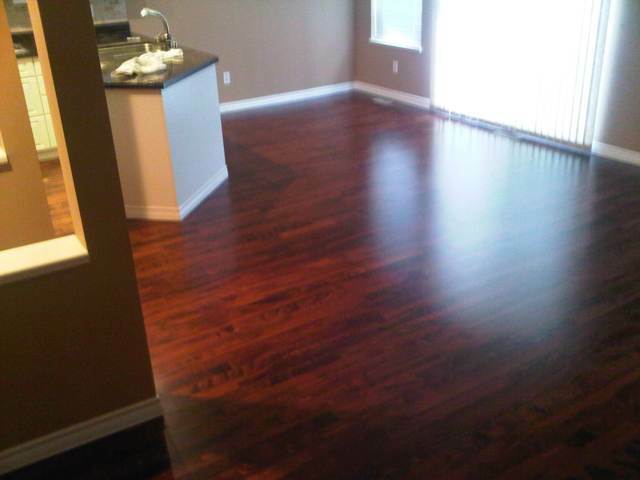 -Know what products were used to finish and clean your wood floor. 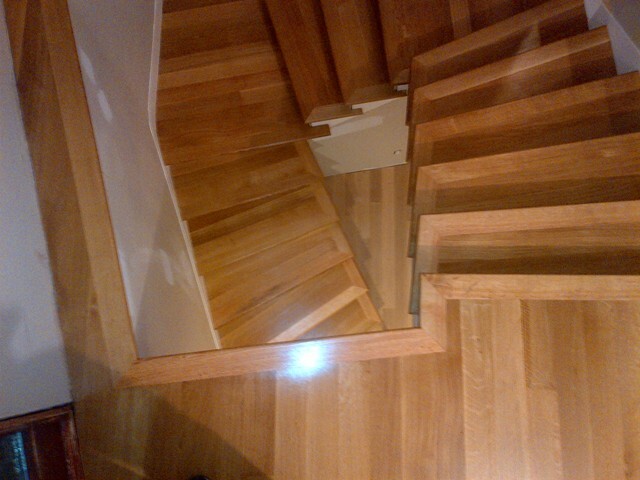 -Keep track of the dates (month/year) that the floor was installed, finished, refinished, and/orrepaired. -Remember/record the company name of your floor installer and finisher. -When moving, leave the above information in the home. -Minor repairs may be made using Glitsa Gold Seal Aerosol®. Follow label instructions. -As your floor begins to show wear and Glitsa Clean® no longer brings back the luster in your wood floor, recoating the floor may be necessary. Contact your floor contractor. Glitsa gold seal Swedish Finish is a Conversion Varnish finish coating. Swedish finish also has a reputation for durability unmatched by all but a few heavy-duty commercial grade finishes. highly volatile and toxic, and requires special precautions, including customers planning to be off the premises for at least a day or three after the final coat is applied, as well as removing pets and plants from the work area for the same duration. We may also ask that appliances with pilot lights be turned off or disconnected prior to the commencement of work. Do not worry about your home if you want to go away I will relight pilot lights and restart the heat and hot water if they had to be turned off! . I will also do the initial ventilation and air exchange. Light foot traffic may resume after 24 hours can be temporarily covered for up to six hours and worked on for the day picking up any temporary coverings so the floor can breathe and cure quickly. And the recommended furniture move back in after 72 hours provided the home was heated. The furniture may be replaced after three days, but the finish is not fully cured for up to 15 days. and in some situations, If you apply more than the standard amount ,there can be more off gassing for a longer period. The Glitsa top coat has a sweeter smell to it, where the two component under coating (the seal coats) have given Glitsa Swedish its ferocious smell reputation therefore area rugs should not be put back on the floor for as long as is tolerable (if areas are covered before the end of this curing period, the covered areas will cure more slowly, and could result in more pronounced color differences between exposed and covered areas). Swedish finish is a two-up to five coat procedure. The primary disadvantage of the Swedish finish is the powerful and unpleasant odor. We generally apply two or three troweled layers and two heavy mopped coats of Glitsa Swedish finish on successive days, and AHF-all hardwood floor ltd always recommends vacating the premises while these coats of finish are being applied. Sensitivity to the solvents in the finish varies greatly from individual to individual, and some customers have reported a lingering odor for as long as a week after the final coat is applied. The majority of our customers who choose Swedish finish, however, find that if the house can be aired out soon after the final coat is dry, they are sometimes able to move back in the next day. certainly after three days!